Billick’s Review: Who says NCAA has market cornered on thrillers? 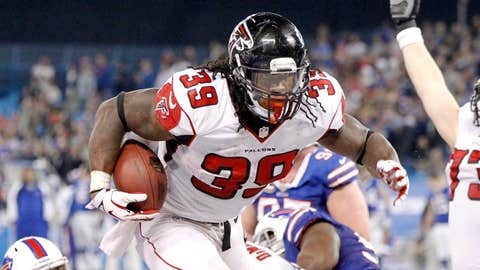 Falcons RB Steven Jackson helped Atlanta end a losing streak, but it didn't come easy. This week was one of the most exciting football weeks in recent memory. It’s hard to look beyond the fantastic finishes of Saturday and Sunday, but on college football’s rivalry weekend, it was one of the NFL’s fiercest rivalries that set the tone for the rest of the week. The Ravens’ 22-20 victory over the Steelers on Thanksgiving night has been overshadowed by all the talk about Mike Tomlin’s interference and the appropriate penalty for such an action, but this was a game that came down to the final minute and was the ninth time in the past 12 meetings that this game was decided by three or fewer points. With just 1:03 left to play, the Steelers scored on a 1-yard touchdown pass from Ben Roethlisberger to Jerricho Cotchery to close the gap to 22-20, but Roethlisbeger’s two-point attempt slipped through the hands of Emmanuel Sanders. The win, along with the Titans’ loss, pushed the Ravens back into the playoff picture as the sixth seed with a 6-6 record. The Ravens’ two-point win was the 88th game of the season decided by seven or fewer points and already the second of the week — the Cowboys held onto a seven-point victory over the Raiders earlier on Thanksgiving Day. On Sunday, there would be eight more games added to this list, making it 96 for the season. The record through 12 weeks is 89. With so many games being decided by such a small margin, we were certain to see some fantastic finishes that rivaled what we saw on Saturday when the Ohio State Buckeyes stayed undefeated and moved to No. 2 in the BCS polls by surviving a late surge and a failed two-point conversion by the Michigan Wolverines before the Alabama Crimson Tide were rolled by the Auburn Tigers on a last-second missed field goal returned from nine yards deep in the end zone for a touchdown. While the NFL’s version lacked the overall drama of the Auburn victory, it was the sheer number of close games, including two that went into overtime, that capped the extraordinarily exciting weekend of football. Even the Jaguars and Browns traded punches in a back-and-forth battle until Chad Henne connected with Cecil Shorts with 40 seconds remaining to win the game 32-28. Despite allowing Josh Gordon to catch 10 passes for 261 yards and two touchdowns, the Jaguars have now won three of their last four and have won back-to-back games for the first time since 2010. The Eagles won their fourth in a row by snapping the Cardinals’ four-game winning streak. While the Eagles were in control for the majority of the game, the Cardinals did get a final possession with 2:03 remaining and trailing by just three points, but sputtered out on a four-play series that totaled just five yards before the Eagles ran out the clock on their ensuing possession. Nick Foles is now 5-1 as the starter and has thrown an amazing 19 touchdowns without a single interception yet this season, just one shy of the record Peyton Manning set earlier this year. The Patriots overcame yet another first-half deficit to beat the Texans in a game that featured five lead changes in the second half alone, but the Patriots put up back-to-back 53-yard field goals late in the fourth quarter to seal the 34-31 win. Bill Belichick is now just the fourth coach in NFL history to be 100 games over .500 with a single team. But it hasn’t been a cakewalk these past three weeks. The Patriots have been outscored 51-10 in their last three first halves combined but have rallied back by outscoring their opponents 78-35 in the second halves or overtime in those same three games. In what was the most dramatic finish on Sunday, the Vikings outlasted the Bears in their second overtime game in a row and narrowly escaped becoming the first team to tie twice in season since 1973. The Bears won the coin toss in overtime and after making back-to-back first downs, stalled out after a holding penalty on Jermon Bushrod put them behind the chains near midfield. The Vikings took the ensuing possession all the way down to the Bears 21-yard-line and kicked what should have been the game-winning field goal, but a rare, yet correct, facemask penalty was called on the kicking team that pushed them back 15 yards to the 36. The Vikings gave the ball to Adrian Peterson on the replayed third down in an attempt to gain some of those yards back, but he lost three when he was tackled in the backfield trying to bounce a run to the outside. Surely enough, Blair Walsh hooked the 57-yard attempt wide to the left. And six plays later, Robbie Gould and the Bears would have a 47-yard field goal attempt for the win. But it was only second down. Hindsight is 20/20 but you can surely make the case that the Bears could have used an additional snap to gain another 3-5 yards with a Matt Forte run to set up a more makeable field goal. Gould pushed his attempt wide to the right and the Vikings won with a field goal on the next possession. In the second overtime game of the day, the Falcons rallied with back-to-back fumble recoveries to beat the Bills in Toronto. Atlanta first forced OT by stripping Stevie Johnson after a catch and run that would have at least given Buffalo a chance to kick the game-winning field goal, and then on the first defensive series in OT, the Falcons stripped Scott Chandler to set up their offense to go down and win the game. It was Atlanta’s first win since Week 7 and the Falcons’ first road win of the season. In what was the most anticipated game, the Broncos traveled to Arrowhead Stadium in Kansas City and gave the Chiefs their third loss in a row and second at home in just as many weeks. The Chiefs even turned Peyton Manning over twice in his first four possessions and held a 14-point lead in the second quarter before the Broncos scored four unanswered touchdowns to take a 14-point lead of their own. Early in the fourth quarter, the Chiefs scored on a 17-play drive to get within a touchdown and forced the Broncos to punt with 3:32 remaining. The Chiefs took the ball all the way down to the Broncos’ 13-yard-line, but failed to convert on a fourth-and-4 snap to end the game. Alex Smith played his best game for Kansas City, fighting through embarrassing drops to keep the Chiefs in the game and proved that he can orchestrate a potent offense that can keep up in the postseason, but his throw on fourth down left a lot to be desired. The safety didn’t bite on his pump fake at all and was sitting directly in the throwing lane. The Bengals beat the Chargers with a seven-point margin, but the final points were scored in the third quarter and it was far less exciting than the previous games. The Giants finished off the weekend with a 10-point fourth quarter and a seven-point defeat of the Redskins. With the loss, the Redskins have now been mathematically eliminated from the playoffs and the Giants are two back with just four to play in the NFC East.